I am so excited to post this Q and A with the one and only uber-talented Connally McDougall. 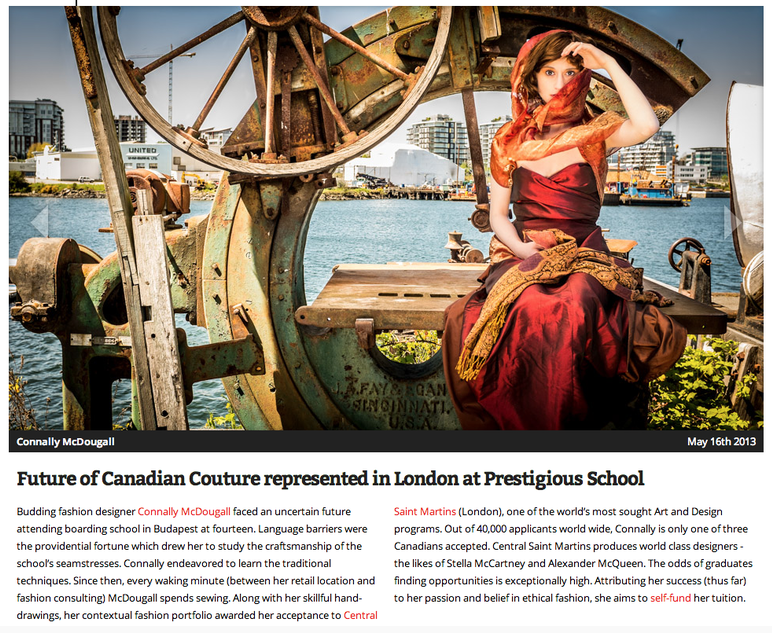 This Canadian-born, England-based young designer caught the eye of Niche Magazine editor Tracey Drake from a group of 11 applicants vying for the magazine's sponsorship at Vancouver Fashion Week F/W 14. After rocking the runway, she went on to capture the hearts of several us attending. As we sat and chatted with her between shows for the next few days, it quickly became apparent that - in addition to her appealing design work - she had a generous spirit led by ethical intentions. Fashion and Eco are united in her collection. The day after McDougall's collection rocked the runway she entered the venue with a huge smile on her face and couldn't wait to share the good news with all of us. An email had just arrived with an invitation to show at the first ever Plitzs Fashion Week China in Beijing being held in June. She was the only Eco designer to be invited. What a coup! But there was a down side. She had only just started this journey as a designer. Anyone familiar with the industry knows those first few years are tough financially. Then there were the expenses she had just shouldered to come back to Canada to promote her line. The answer, an Indiegogo campaign! As of today - her new campaign to help make Beijing a reality has just gone one line with a great set of perks to reward those who chose to be a part of her journey. I have already put my name on one of the beautiful scarves she created just for this fundraiser. And remember - the whole point of these campaigns is coming together as a community so that every $1 offered can have a huge impact as it joins with other contributions. You can be a part of this journey by clicking on this link to her Ethical Fashion Fund page. What were you like as a kid? As a teen? I've always made good friends with my imagination and others that could play make-believe as well. My little sister was and is my best friend, though as we moved to countries where there was a language barrier, I spent most of my time on my own. Can you remember something from when you were younger that hinted fashion design might be in your future? I loved changing outfits five, six, twelve times a day. Even though we didn't have that many clothes, I made some interesting ensembles using household items. Where did you choose to study fashion design and why? Early on, I decided that Central Saint Martins was the right choice for me, based on its reputation in the industry, its alumni and the myriad of doors that an education from CSM opens. That, and the fact that it was in London, which immediately felt like home from day one. In school, what was hard? What was easy? Is there a fond memory from your time in school? It was hard to be up against seventeen year old kids who had already gotten some training or came from a family with the means to provide them with the best equipment and budget for projects. I was self-taught and worked full time every day since I was sixteen on top of going to school, and it was frustrating to struggle to achieve less recognition than the students who had mommy and daddy banking their education and funding their project budgets. I'm not saying that grades can be bought, but when you have access to superior materials, it's much easier to woo the instructors. However, my age and life experience gave me a huge leg up in terms of the written, group and cultural studies elements. When I started at CSM, I already had launched my own creative label, sold my work in shops to individuals and had a solid vision for my brand. Many of the other students lacked that tenacity and assertive quality and simply needed time and maturity to grow into their capabilities. I made friends more easily with the tutors and instructors and found myself relating better to their life experiences than those of my younger peers. One tutor, Chandrakala Doshi told me, after a particularly frustrating day "Connally, you see these people around you? They may have more money or resources, but anybody can buy a sweatshop factory. You, on the other hand, have the ideas, and nobody can take or buy those from you. One day you WILL be a great fashion designer." Why did you choose to embrace Eco Fashions and how is it expressed in your brand? As a designer, I believe in excellence on all levels. Innovative design, impeccable craftsmanship and responsible, sustainable production. You cannot call something truly excellent if the environment or workers suffer at the hand of success. I use all natural materials sourced from small mills in the UK. I personally go to the farms, the mills, and the production houses to see how the cloth is made and meet the individuals helping my collections come to life. When I do use leather, it is all vegetable tanned, farm hides. This means that the entire animal is being used to feed the community and rather than discarding the leather, it is processed in a combination of vitamin and plant oils to achieve its finished, tanned state, rather than soaked in chemicals and animal byproducts to hasten the process. Describe your brand. Who is your customer? I design for international, confident women between the ages of 25-125. I believe that maturity and experience are incredibly sensual and should be just as celebrated as youth and naïveté. For me, a woman is far more attractive when her intellect shows more than her skin. For the pieces I design for more intimate settings, it is about making the woman feel amazing in her own flesh, not just about seduction. 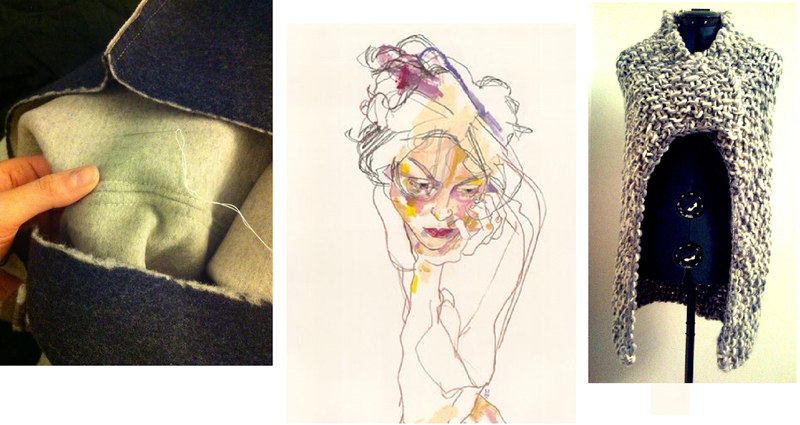 Talk about your current collection - inspiration, palette, fabrics. My current FW2014 collection - titled "Remote Places" - was inspired by a trip to Mongolia and the indigenous women. It is a culture where the women dress for both utility and ceremony, and the fabrics I chose to work with mirror the varied scope of terrain in the sparsely populated nation. Rugged knits, heavy wool and alpaca cocoon shapes paired with sleek, soft silks, and bobbled harness the spirit and vitality of the majestic country. The colour palette of cream, charcoal, black and a bold poppy red represent the connection between the landscapes and tribal structures which appear on the Mongolian horizons. 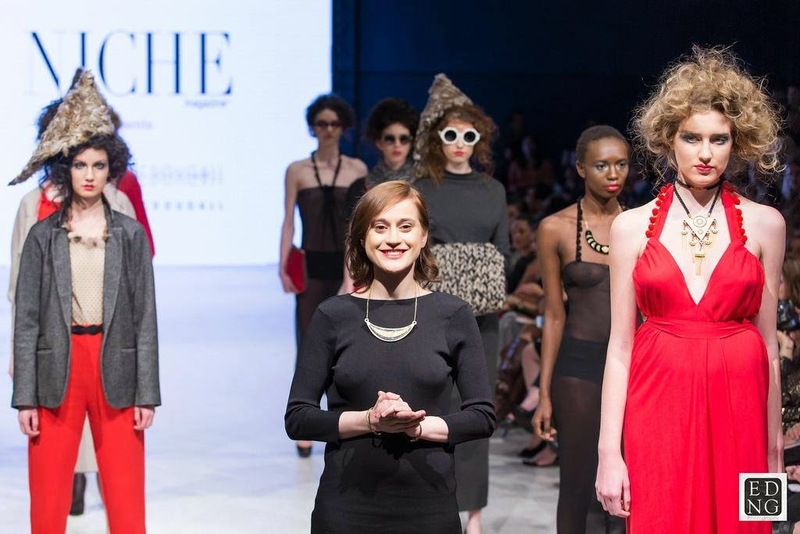 What it was like coming to Vancouver Fashion Week? It was an utter whirlwind. I had just under five weeks to make the entire collection and didn't have the first fitting until the morning of the show. 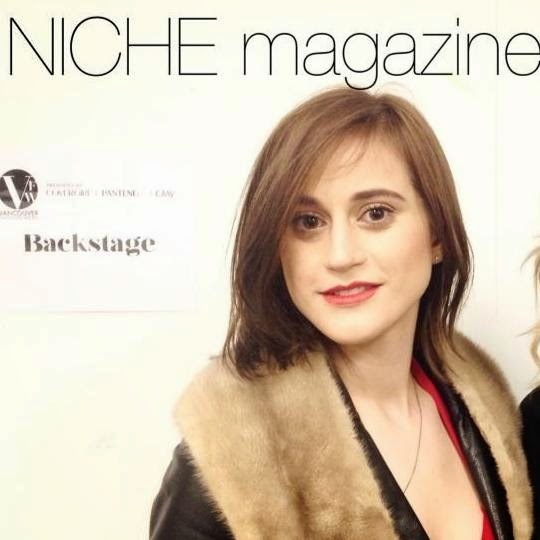 NICHE magazine generously sponsored my registration fees and were immensely helpful in the preparation and backstage elements of producing the show. As I am preparing to show my collection in Beijing this June at PLITZS New York Fashion Week CHINA and then Spring-Summer 2015 collection at Vancouver Fashion Week this upcoming October, I know I will greatly miss their support and hands-on help. While you were in Vancouver you received the invitation to show at the very first ever ”PLITZS New York Fashion Week CHINA.” What was your reaction to receiving that email? I was stunned. My initial reaction was to think, "This can't be real. It's so soon, how will I possibly afford this?" - which was quickly overrun with feelings of excitement, eager anticipation and gratitude to be chosen for this unique and amazing opportunity. What unique can you bring to the runway in China? What are the challenges? My collection is the only sustainable, ethically produced collection chosen to show during this fashion week. It is creating a lot of buzz as the new Chinese Fashion Industry is looking to improve its reputation on the global fashion scene and presents a perspective that has long been forgotten in Asia in favour of cheap, disposable clothing. The Asian market is growing more and more responsible and savvy and the younger generation's voice is being heard, and that is that they demand quality, and they deserve quality. The challenges are obviously the language barrier (although I am learning some basic Mandarin! ), navigation and most pressingly, the funding, the registration fee for the show is $4600+5%tax plus airfare. The fee does cover my accommodation, but in all, it will cost me approximately $6000 to be able to take this incredible opportunity. As you look ahead, what are the goals for your brand. My immediate goals are to continue to produce collections to show at Vancouver, London and other global fashion weeks and events. I also am looking for retailers to carry my line and investors to come on board to bring my brand to a wider audience. Right now I am a one-woman show, and I am looking for the investment and sponsorship funding to hire interns and employees on both the business and technical sides of the brand. Anything I didn't ask that you wanted to talk about? It's not always easy to do things with integrity. You have to love fashion with all of your heart, because it doesn't pay you first. But I'm a hard worker, a driven innovator and I truly believe in my vision. The world is ready and we deserve ethical fashion to be at the forefront of the global fashion stage. Furthermore, Canadian retailers need to step alongside emerging designers both from an economical and creative point of view. As I read in an article you shared with me, Canadian radio stations are required to play a minimum of 20% Canadian content. If our retailers did the same with designers, not only would national revenues increase, but our reputation on the global fashion scene would make a huge impact. Facebook at https://www.facebook.com/ConnallyMcdougallDesign. 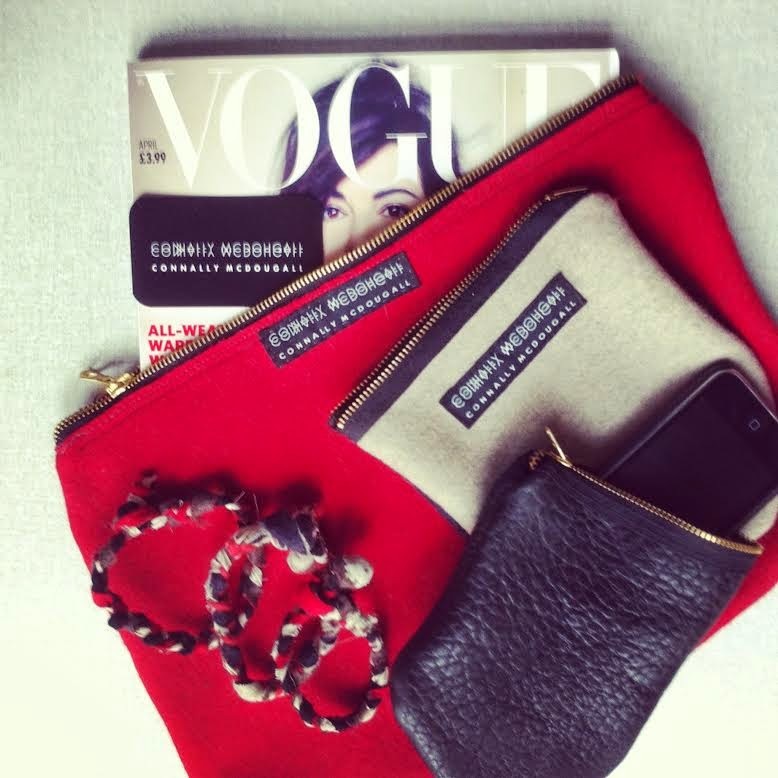 And don't forget to take a moment to pop by her Ethical Fashion Fund and make a quick donation.